Lots of us are sitting around on Saturday night, September 8, 2018, waiting for the 11:00 PM National Hurricane Center update. Unfortunately things do not look good for North Carolina and South Carolina. There is a good chance that Florence could approach the coast as a Category 4 storm. Nothing that we have faced has prepared us for that. The closest that we came was Friday, August 27, 2011, when Hurricane Irene paid us a visit with the outer bands of rain first starting around 5 PM that afternoon. The storm’s winds were howling well before we went to bed that evening. Irene continued to pound us all day Saturday. Only at 5 PM on Saturday did I venture out to start our generator as the winds slowed and the rain finally started to back off. While I have no accurate way of measuring the winds, from my experience, I would judge our winds in the 75–80 MPH range. Our power went out at 11 AM on Saturday. We had somewhere between eleven and fifteen inches of rain, but our power was back on by 1 AM Sunday just fourteen hours after we lost it. I never took my boat off my side pole lift where it was secured to my pickup truck and bulkhead. Sunday evening we had an ice cream cone at the Sweet Spot on Emerald Isle about seven miles from our house. Monday, I walked over 5.3 miles on the beaches at the Point on Emerald Isle and marveled at the additional twelve to fifteen acres of sand that Irene added to the beach there. Other than the destruction of some well loved bottle trees at a remote local beach, the worst damage I saw in the area was the shed roof of Winberry’s Produce peeled back, a boat with a tree across it, some missing siding, and shingles. But the headlines of the national newspapers and the evening news are all about the devastation and flooding that Irene caused in New Jersey, New York, and Vermont. How is it that an area only 33 miles from where Irene made landfall escaped with only minor damage? Obviously some of it is luck, but there are also elements of topography, hydrology, history, location, planning, and preparation that are part of the story. A little background will make things clearer. In my mind’s eye I can still see the water up to the axles of the car as my mother drove us away from Hurricane Hazel in 1954. I was five years old then, and 57 years later it is still a vivid memory. That day we retreated to our home in Lewisville, a small town outside Winston-Salem located in the relative safety of North Carolina’s Piedmont area. With that memory still stuck in my head, it is something of a wonder that in 2004, my wife, Glenda, and I started looking for a home along the east coast. We looked as far north as Assateague on Virginia’s eastern shore, and as far south as Oak Island, just south of Wilmington. In deciding where to live, we carried with us a lot of experience gathered over the years. Our lives have covered much of the east coast. I lived for sixteen years in the Canadian Maritimes. Glenda was there for fourteen years. Part of our time in Canada was on the shores of the Bay of Fundy where extreme weather often seemed like the norm rather than the exception. I know that during my time on the Bay of Fundy, I saw winds approaching 100 miles per hours because the foam from the bay often blew the mile or so inland and froze around the power lines near our 200 year old home. We also spent over twenty years in Roanoke, Virginia on the side of a mountain. Winds of sixty to seventy miles per hour were not uncommon at our mountain home in Virginia. We also got a taste of hurricanes in Roanoke. Hurricane Hugo welcomed us to Roanoke in September 1989 when it crashed a tree into the screen porch of our new home just before closing. Living in Roanoke also taught us that eleven or twelve inches of rain could make mountain valleys deadly. Many times we saw the main road in Roanoke, Route 419, flooded by heavy rain storms often spawned by the remnants of hurricanes as they approached the Blue Ridge mountains. While I did a lot of studying of maps and hurricane tracks when picking our next home, one of the most influential factors which helped our decision to move to western Carteret County was the presence of old buildings both in Swansboro and Beaufort dating back to the 1700s. My research showed that hurricanes, like Hurricane Donna in 1960, sometimes visit the area, but I also discovered that the area offers a degree of protection from hurricanes. To start with Carteret County goes downhill from west to east. The farther east you live in Carteret County, the closer to sea level you are. 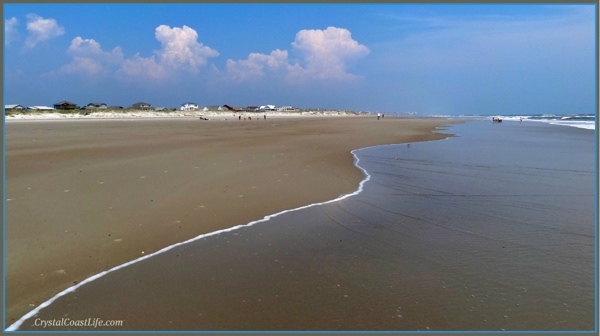 Most people have a picture in their minds of barrier islands as a narrow strand of sand. Fortunately there are serious barrier islands like Emerald Isle. Emerald Isle at the western end between us and the Atlantic is far different from the northern Outer Banks and Route 12 north of Buxton. Emerald Isle is heavily treed and is a substantial island. Living up the White Oak River north of Emerald Isle is far different from living in Rodanthe or South Nags Head. A few years living on the Bay Fundy in Nova Scotia is a good life lesson. Those years imprinted exactly what happens when a large body of water get forced into a narrow space. There is nothing like tides of twenty-eight feet to get that principle across. Our Bay of Fundy experience was one reason we ruled out living up a bay with a huge of expanse of water in front of us. When the wind starts blowing that water, it has to go someplace even if that place is around your house. If a large body of water like Pamilico Sound has nothing between it and your doorstep, there is a good chance you will find it on your doorstep one day. New Bern and Oriental are good cases in point. Still we wanted to live on the water and knew that our decision would likely put us in a floodplain. However, one really good thing about living in North Carolina, is that the state has been dealing with hurricanes for years. Homes are built to some serious standards, and I felt comfortable living in a new home that was built to sit above the 100 year flooding like our home does. However, until you live in a home, and it is tested, you really don’t know what to expect. On September 30, 2010, we had an amazing 20.25 inches of rain at our home in less than 8 hours. While the moisture was widespread and impacted the whole drainage area of the White Oak River, we came through the situation fine. The water just got to the top of our dock, and when the tide started going out, the water went out while the torrential rain continued for another four hours. There is some benefit to having a two-mile wide tidal river as a drain. Still our 2010 event had no wind so we had not experienced any wind greater than 35–45 MPH while living in Carteret County. With that in mind, we prepared meticulously for Hurricane Irene. All our outside furniture was either moved inside or tied with bungee cords to the deck railing. We bought a generator to add to the emergency supplies we had collected over the years. We stockpiled some food, water, and basic necessities and waited for Irene’s impact. Irene turned out to be a really good test. Skip Waters, one of the local weathermen, said that Irene was one of the worst if not the worst storm he had seen in his 29 years in the area. While he had seen storms with more wind or rain, none lasted as long and had the combination of wind that wouldn’t stop and rain that kept pouring down. As these flood pictures show, our home was in no danger as it is several feet above the level of our dock. The water was also lower than what we saw in the event in 2010. While I was sorry to see some places that we had considered as home locations flood, I was pleased not to be there when they flooded. There is a little magic on being on a tidal river with a couple of bridges constricting its entrance. Our river is a short one with lots of marshes to absorb water and a watershed area that is relatively small. We also have no cities on the White Oak, and there is huge area of marsh behind Emerald Isle and between us and the Atlantic Ocean. Because of the way our house is situated, our worst winds are from the southwest. We mostly got east and north winds from Irene. I am also very thankful for the long term planning of Carteret-Craven Electric Cooperative. Being only a couple of miles from their impressive power poles likely had something to do with our power being restored so quickly. Of course the next time around, Mother Nature could deal more severely with us, but for now we are pleased that our prayers were answered. It certainly didn’t hurt that we were well prepared. As we continue to hear of areas without power or still flooded, I am happy to report that beyond a few trees downed and some limbs pruned from standing trees, there was little or no damage in our neighborhood. One neighbor did have a tree fall across his boat and total it. Still I would just as soon not be tested with another hurricane this year. As the news picture I saw recently of a family sitting on the steps of their destroyed 1903 Albemarle Sound cottage showed, what Mother Nature spares one year can be quickly taken another time. It is a price you pay for living in an area of amazing natural splendor. Beyond knowing that Mother Nature always has the upper hand, I will continue to be vigilant while enjoying this spectacularly beautiful area. I believe the risks of living here are well worth what we get in return. Irene even added a lot of sand to beaches over by the Point on Emerald Isle. I also posted a lot of pictures of my hike at this Google photos album. For people looking for damage photos, there are almost none from this area from Irene, but Florence could be a totally different story. We could be hit with much higher winds, a higher surge, and then far more rainfall than Irene. If it looks like Florence is going to hit within thirty or forty miles of us, we will likely batten everything down and head west. From the rain forecast that I am seeing, we will have to go several hours west to get out of the deluge. Some favorite spots like Winston-Salem and Roanoke appear to be in the heavy rainfall forecast area so it might be a long drive to safety.